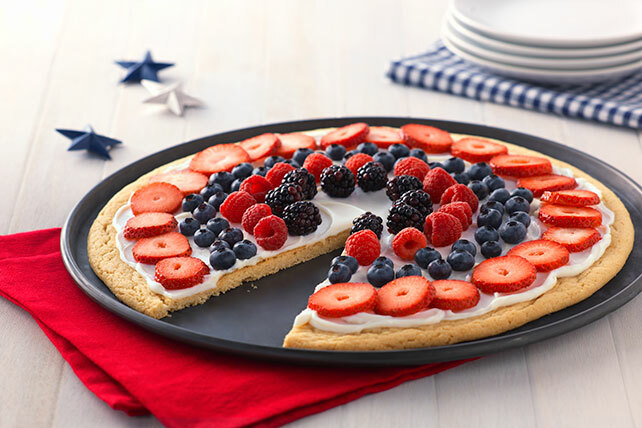 Bring this Fourth of July Fruit Pizza to your holiday cookout! Top your cookie crust with colorful fruit in this Fourth of July Fruit Pizza recipe. Line 12-inch pizza pan with aluminum foil; spray with cooking spray. Place cookie dough slices in single layer on bottom of prepared pan; press to completely cover bottom of pan. Bake 14 min. or until edge is lightly browned; cool completely. Beat cream cheese, sugar and vanilla with mixer until blended; spread onto crust. Top with berries. Refrigerate 2 hours.